Facebook on Thursday started rolling out a feature that will allow users of its mobile app to use smartphone location to discover friends near them. As said by product manager Andrea Vaccari in a blog announcement, this new optional “nearby friends” feature “will help users to discover which friends are nearby or on the go. “If you turn on Nearby Friends, you’ll occasionally be notified when friends are nearby, so you can get in touch with them and meet up,” Vaccari said. With the feature, Facebook takes a page from other location-based services including the network Foursquare, numerous dating apps and the recently launched social network aggregator SocialRadar. 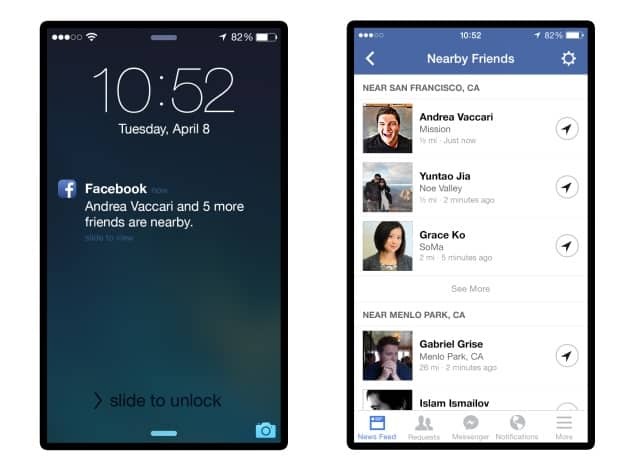 Facebook users will now be able to share a precise location with the particular friends for a set period of time. “When you share your precise location, the friend you choose will see exactly where you are on a map, which helps you find each other,” said Vaccari. Facebook had an estimated 1.23 billion users at the end of December, and more than one billion who use the social network on a mobile device. The “nearby friends” feature will be available for Android and iPhone users in the United States over the coming weeks.